At this time of year, there’s no better way to begin the work week than with news that a client’s book has made a year-end best-of list. 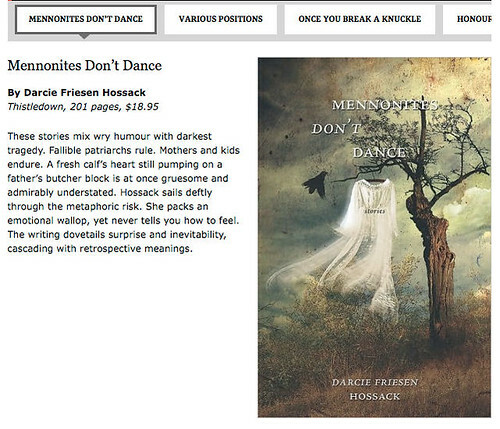 Things are off to a great start here at the HSW Literary Agency thanks to the Globe and Mail, which named Darcie Friesen Hossack‘s debut collection of short stories, Mennonites Don’t Dance, as one of the five best first fiction titles of 2011! Though the collection was published by Saskatchewan’s Thistledown Press in late 2010, it first garnered widespread attention after it was named to the regional shortlist for the 2011 Commonwealth Writers’ Prize for Best First Book in February, and was selected as the runner-up for the Danuta Gleed Literary Award in May. A screencap of the Globe announcement and citation is below the cut. Congratulations, Darcie!